Vintage video maker makes a comeback. Once upon a time, MacPhun released a video editing app called Vintage Video Maker, a nice but perhaps a little overlooked video utility to turn videos into old looking footage. This story has an happy ending: Vintage Video Maker was recently upgraded and its name was changed to Silent Film Director. With enhanced features, a newly designed UI and more stability than its predecessor, Silent Film Director is what you need for giving your plain videos a beautiful vintage flavor. Share via email, Facebook, YouTube. 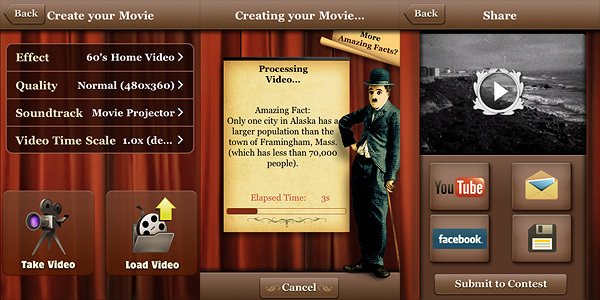 As I said, Silent Film Director allows users to process their videos in a delightful retro style. MacPhun’s app is more than that though: it also allows basic video editing, which includes cropping, adding transitions, title cards, and custom soundtracks. Silent Film Director is available in two versions: one called Standard, that is basically what you get with your initial purchase, and the Pro one, which requires an additional in-app purchase (£0.59||$0.99||€0.79). The Standard version mainly allows video post-processing. You can record the video from within the app or load it from the camera roll. You can also import external videos to your device through iTunes and ftp connection. Six different styles are available for giving your videos a believable vintage look. Choices range from the dusty and scratchy black and white of 20’s films to the washed-out and overly saturated lo-fi style of 70’s home movies. All the effects are very well-done. Other than applying filters, you can choose a soundtrack from the app’s limited selection, from your iPod or from your computer — and of course, you can choose to keep the original audio of your video. As a bonus, you can also alter the video’s speed, decreasing or increasing it. Rendering times are very fast compared to other apps, even on older devices — thumbs up to developers for the amazing improvement from the older Vintage Video Maker app. After you generate your processed video, you can either save it, mail it or share it on Facebook and Youtube. The Pro version lets the user create more complex projects than Standard mode. It’s in fact possible to add more video clips to a single project and to enrich it with photos, transitions, and titles; by dragging and dropping each element independently and by cropping segments of footage, you have a portable editing studio at your fingertips. When your project is complete, you can proceed to the post-processing stage and then you finally save. For the quality of the effects, for the features included, for the clear and stylish interface and for the overall experience, Silent Film Director deserves a full score. If you’re into all things vintage, this is one of the apps you must have in your collection. Compatibility: iPhone, iPod Touch, iPad. iOS 4.2 or later. Silent Film Director Free For 1 Day! Photo Apps on Sale for the 4th of July! I wish they added a dropbox feature. The rest is perfect! How Do I Delete Photos on My iPhone? How Do I Preserve iPhone Battery? Copyright © 2019 Appotography.com. All rights reserved.